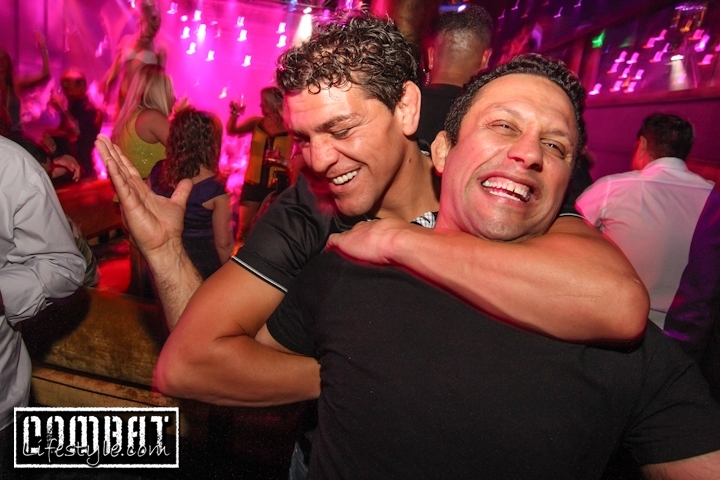 Nick Diaz Chokes Out Renzo Gracie at an MMA 4th of July Party at Haze Nightclub inside the Aria Hotel and Casino. Tracy Lee and Sam Hon threw the event together with no notice because everyone seemed without plans for the evening. Haze was gracious enough to host us and we had about 50 people attend.. 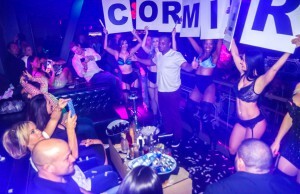 The bonus that night was the bikini contest the club put on with some lil’ hotties with bodies! 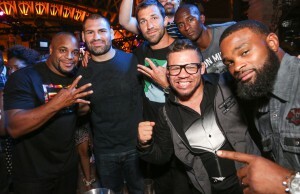 Later on in the night we ended up at Renzo Gracie’s table with Nick Diaz and Kit Cope. Nick and Renzo started goofing around and Nick pretends to choke out Renzo as you can see from the above photo. Nick has been all smiles the last couple weeks, as we are sure you have seen from our pics.. Maybe Promoter is a much better title for him than fighter? Please leave your thoughts in the comments below! PS: first pic, we stopped by Korean BBQ to catch up with Ben Henderson and his lady.. Carry on!